Empty Cobblestone Streets — YWAM AUSTRALIA - DO A DTS IN BRISBANE! 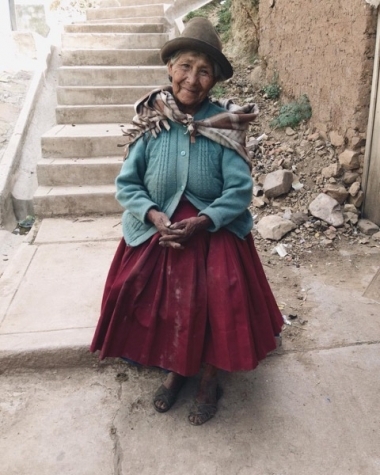 Cobblestone pathways, the laughter of small children and a radiant lady made that day in Cusco, Peru very different to the others. As we walked up the pavement thinking we were heading home after a long afternoon of ministry, God had other plans. A lady, filled with so much beauty was sitting on the concrete outside of her shop. Speaking the old Peruvian language of Quechua, we began chatting. Our translator translated Quechua into Spanish and my friend translated Spanish into English. As she began telling us her story, we knew that this interaction was one that God divinely intended. After a fulfilled afternoon with a family in the mountains, He knew we were not ready to go home. I am so thankful that we didn't! Her story was filled with so much trust and sovereignty, pointing to the faithfulness of God. To begin with, she was a little uncertain about who we were and asked us if we were from a temple. It soon became clear that God had been working in her life and pursuing her all along, far more than she was aware of. Living alone in the mountains, walking with her cow to and from work and trying extremely hard to provide for herself, she had encountered the Father! For years and years this elderly lady had been unable to open her hands. One night while sleeping, she had a vision of a man in white coming to visit her. When she woke up, she was able to open her hands and the pain had decreased. We believe that this man in white was Jesus. Over and over I have heard stories of people having visions of a man in white, but witnessing this first hand was incredible. Walking through the mountains to get home, is likely a lonely, somewhat frightening experience, but she uses this time to communicate with God. One late afternoon while walking through a storm she was talking with Him, and this is why she believes she was protected from the lightening. In this moment, God revealed His majesty through the chaos of a storm, and showed off His protection in the midst of that. Outside of her shop lived wild dogs. These dogs barked at everyone, even the tiniest of children. As we approached they were completely calm and laid down next to us. After twenty minutes of conversation and being in her presence, it was incredible to see truly how faithful God is. The testimonies this lady shared without even knowing who God is, showed He is always there. Even the simple fact that the dogs did not make a fuss, was opposite to the way they had been behaving. He calls us into the world to share and display the love He so desperately has for everyone. He calls us to the reached and unreached, the poor and rich, even to those working in Brisbane city or far off places. As well as the amazing, grace-filled honour we have to partner with Him, He always shows up. He had this lady's heart positioned in such a way, that when we began chatting with her, she was open to receive prayer. We prayed for continued healing over her body, explained the gospel and what a relationship with God can be like. Before we left, we took photos together and then one of just her. As she stood up, we all were taken away by her beauty. God had been ravishing His love upon her, and she was the definition of radiant. To think, if we hadn't walked up the cobblestone street we would have completely missed out on this opportunity. I am so thankful for Gods intimacy leading us into the perfectly broken places.